Today, the Trump-Pence administration’s policy of banning trans people from serving openly in the armed services comes into force. Like anyone who serves in the military, trans people deserve to be treated with dignity and respect. Not only is this discriminatory, it also serve to publicly demonise trans people. The actions of the Trump-Pence administration ‘other’ trans people and contribute to a climate of fear. We cannot underestimate the harm this causes to trans people and the communities on the receiving end of these attacks. The rowing back of rights of trans people in the US is an alarming reminder that the progress we’ve made towards equality is fragile. The rowing back of rights of trans people in the US is an alarming reminder that the progress we’ve made towards equality is fragile. The swing towards extreme politics and anti-diversity rhetoric we’ve seen gaining momentum worldwide has given the green light to those who see LGBT human rights as an affront to their views. This has given way for people to try and push further divisions in society. The news out of the US comes at a time when trans people in Britain are experiencing high levels of abuse and discrimination. 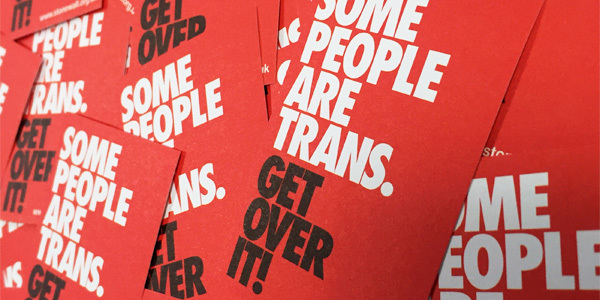 Stonewall research shows that two in five trans people (41 per cent) have been the victim of a hate crime or incident in the last year. The day-to-day lives of trans people are only being made harder by increasingly frequent attacks and debates about their identity in the media, online and in public spaces. In our interconnected world, events in one country can have a profound impact on many others. In our interconnected world, events in one country can have a profound impact on many others. There are powerful forces seeking to divide communities and target LGBT people. If we care about the right of everyone to be accepted for who they are, and expect every individual to be protected from discrimination, we need to stand up for trans people right now. We want a different future, and it’s one we must fight for together. No-one should stand alone in the face of hate. We will be reaching out to LGBT activists and organisations in the US to offer support. Read the Human Rights Campaign’s statement about the situation.